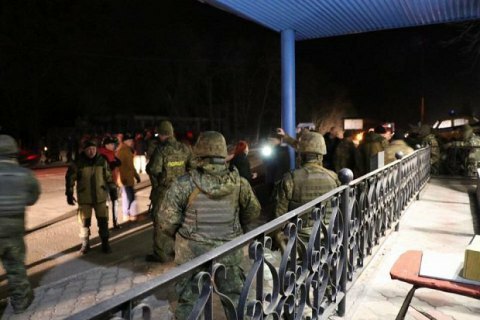 The prosecutor's office of Donetsk Region began a pre-trial investigation into the injury of seven policemen at a checkpoint outside Slovyansk. The PGO said in a statement on 14 March that that police on Monday night stopped a convoy of 13 vehicles on the Kyiv - Dolzhansky highway. During the examination of the documents, 80 passengers of these vehicles, including MP Volodymyr Parasyuk, put up a fight with the police. "People's deputy Parasyuk came out with threats and started insulting police officers and trying to provoke a fight. When he failed, he ordered the people, who arrived with him in the convoy, [to attack police]. In fact, citizen, Parasyuk led the attack," Interior Ministry press center quoted the head of special police squad Yuriy Holuban as saying. In the course of the brawl that ensued, and involved the use of tear gas, several police officers were injured. "An officer of the special unit was hit by a car of the people's deputy and was taken to a hospital." The case is qualified as the use of violence against a law enforcement officer.